Current research of the Shen Laboratory at the Rutgers Cancer Institute of New Jersey focuses the mechanisms by which genomic instability is provoked during tumorigenesis. Using a BRCA2 interacting protein BCCIP and its associated protein network as the platform, we investigate the roles of mammalian homologous recombination (HR) in error-less DNA repair, replication fidelity, and precise mitotic cell division. 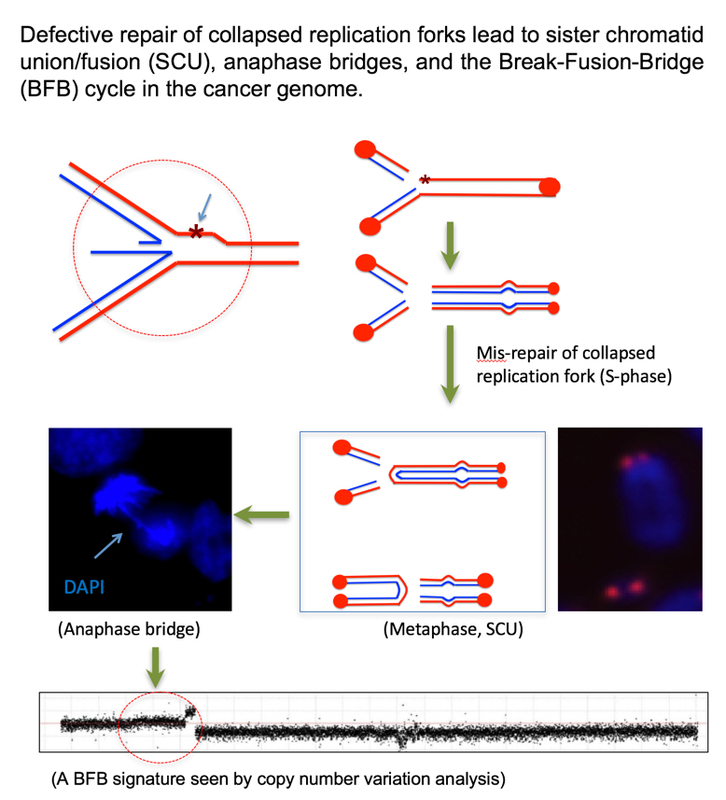 A form of metaphase chromosome abnormalities is sister chromatid union/fusion (SCU), which can subsequently seen as anaphase bridges and contribute to a cancer genomic signature called Breakage-Fusion-Bridge (BFB). Our study found that a partial loss of BCCIP can cause excessive structural chromatid instability including SCU, indicating a mis-repair of collapsed replication forks (PLoS Genomic 2011). We are now interested in further understanding of how BCCIP and HR pathway suppress SCU and the subsequent BFB. In addition to suppressing anaphase bridges and chromatid alterations that consequentially cause mitotic abnormalities, BCCIP can modulate microtubule and mitotic spindle structure directly. BCCIP deficient cells have fragmented spindle poles and dis-orientated spindles (Oncogene 2017). We are interested in how BCCIP ensures mitotic fidelity through the concurrent regulations of microtubule dynamics and the chromosome integrity at mitosis. BCCIP represents a type of unique genes that have caretaker function in the maintenance of genomic integrity, and at the same time is required for cell proliferation. To understand the unique feature of this class of essential caretaker genes in tumorigenesis, we extensively use genetically engineered mouse models. Using a unique BCCIP conditional knockdown mouse model, Shen laboratory reported that a partial and transient deficiency of BCCIP is not only sufficient but also required for medulloblastoma development (Cancer Research 2013). 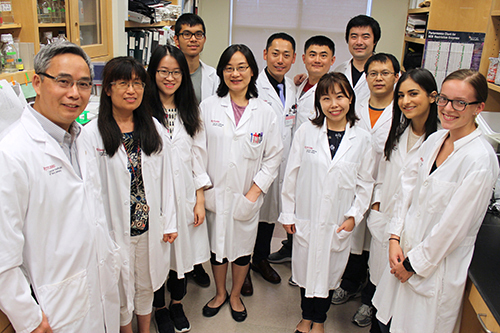 Shen lab thus proposed the concept that a subset of caretaker tumor suppressor genes may function as Suppressors of Initiation but Required for tumor Progression (SIRP). This concept explains why cancer mutations are rarely detected for some of the cell-viability-essential tumor caretaker suppressors. It underscores the importance of non-mutational events in cancer development, and the confounding roles of this special class of tumor suppressors in tumorigenesis. An ongoing effort in the Shen laboratory is to use various mouse models to understand the role of SIRP type of genes in tissue development and tumorigenesis, including how cancers can by-pass the growth-suppression effect of SIRP defects during tumorigenesis. Research in the Shen laboratory is supported by NIH and DoD Breast Cancer Research Program.